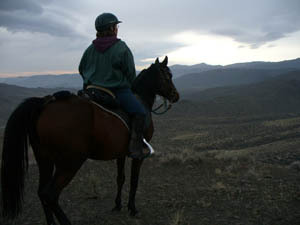 Last night we got the posse-ball rolling to begin searching for K's missing horse at Wilson Creek. Karen and Carol rounded up riders to meet us. I found some ATV groups online and emailed a plea for help, a lookout if they were in the area this holiday weekend. Carol and I met Karen and Pat in the parking lot at Wilson Creek at 10 AM, heavy clouds covering the sky, chance of rain today, chance of snow tomorrow. So - time to plan a strategy, Plan B, since Plan A (Thunder standing in the parking lot, waiting for us to pick him up, no such luck) didn't happen. If you were a runaway horse, where would you go? He was headed toward home (some 15+ miles as the Raven flies) last we saw him, and he was running. Would you stop, turn around and come back to a place you know? Would you come back to the adjacent feedyard, where there's companion animals to hang with - cattle and horses? Would you go up high, where some lost horses have been found, grazing in a meadow (there aren't any in this area)? Would you go to a familiar water trough for a drink in this desert? Pat said often a horse is found within 2 miles - even though it may be a week later - of where you last saw him. Thunder knew this area, would know where the parking lot was, would know the trails he'd been on, would know a nearby water trough. I scaled the hill I'd looked from yesterday with the sweeping 270* view, this time looking with binoculars - nothing. Much of the land was flat, though you can't really make out hidden washes. Some of the rocky hills were too steep - no reason a horse would go up there. 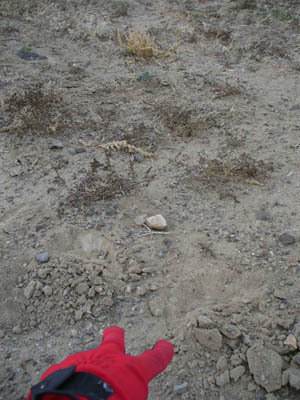 We first checked all around the feedyard (and Carol had talked with them, and left phone numbers with them), and didn't see him, or any hoofprints around the perimeter. Now where? We'd try some closer loops first. We split into pairs, Karen and Pat circling some hills one way, and Carol and I the other, to meet up at the water trough. As Carol and I made our way out onto a trail, it really hit me that we were looking for the virtual needle in one Big Mother Haystack, "a moving needle," said Carol. There's little canyons and hills and mountains and dips and washes - in every direction. 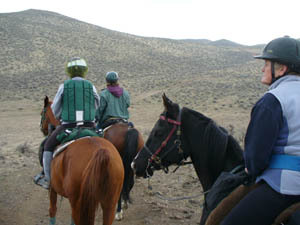 The horse could have been anywhere - we might choose the wrong trail that might have gotten us close to him. And, as Pat said, we might choose the right trail, but he could be moving on the opposite side of a circle from us and we'd never see him. Some sandy areas had hoofprints - from other horses. Thunder was unshod, so that would help if he left us a good print in the sand, but it's hard to get lucky and find a hoofprint on this mostly rocky and hard soil. We doubted the horse would stick to the few roads anyway, he'd be moving across country, or maybe follow an occasional trail. But who really knew? From the top of one hill, we saw a group of 6 riders far below us, headed out the direction Thunder had taken off yesterday. 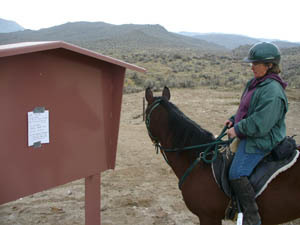 We hoped they'd seen our signs posted, or they might just come across a horse somewhere and know what to do about it. 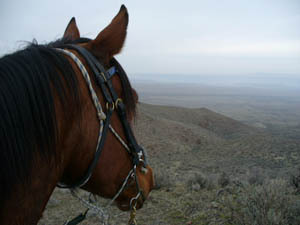 We hoped Thunder might see or hear our horses and they'd whinny back and forth, and he'd be looking for company. We finished our loop back at the trailers, then went to Plan C. Everything I felt told me the horse took off towards home according to his Equine Internal Compass. Carol and I headed off that way. 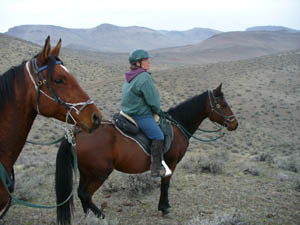 Karen and Pat went opposite, on trails Thunder had ridden quite a bit over. Carol and I thought we'd have a fence to follow, limiting Thunder's direction - and came across 3 open gates. Hoof activity around some, possibly unshod feet - but unable to tell for sure. He could have taken any of them, and that opened up thousands more acres of possibility for him to disappear on. Or he could have taken none of them and gone in a totally different direction from where we were searching. He could be in Nevada by now. We're all little specks on the landscape when you think about it. Rather discouraging. 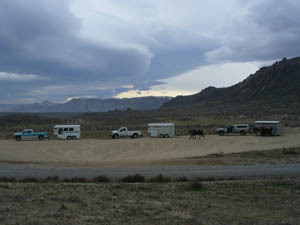 We all returned to the trailers again later - nothing. The 6 other riders we'd seen were heading our way - we were hoping they'd say they found a horse and ask if it was ours - and it turned out to be 2 endurance riders (and 4 of their friends) that Karen had called to come help. They'd headed out a slightly different way and saw nothing. Josette actually knew Thunder, and said she thought he'd be heading downhill, staying off the rocks - which might have taken him through one of the 3 open gates Carol and I passed. We called off our search about 2 PM - dark clouds massing and cold breeze picking up. K's boyfriend was maybe coming out tomorrow to look; we planned on coming back out on Monday. We'd try contacting some other riding groups. We checked in with the sheriff - no found horse reported. We checked on K's progress - broken ribs, collapsed lung, but now other problems surfacing; she was still in the hospital. Dispiriting day. Hard not to think of the horse out there - if he had no tack on, we wouldn't worry so much - and very hard not to think of how hard K must be taking it in the hospital.